Blizzard update claims Friday’s fix should however be working. Towards the end of last month, Overwatch received its first major update that introduced Competitive Play to the multiplayer FPS for the first time. This pretty significant change forced a more serious approach to play, however hasn’t exactly had the smoothest of launches and it seems Blizzard is still trying to figure out the best way to gauge player performance in relation to Skill Rankings. One particular instance which appears to have negatively affected matches is when players decide to duck out before their conclusions. As a result of how the previous system operated, fewer skill points were in turn allocated to winning teams as the game identified an unbalanced 6v5 team member outcome. Naturally, players expressed their concerns with this method, to which Blizzard duly responded to on Friday. 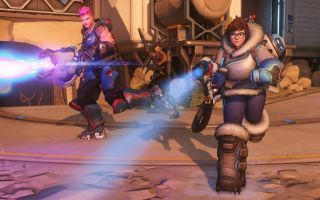 “Previously, if a player from either team left mid-match, the game would automatically recalculate each team’s probability of winning, taking a look at not only who left the match, but also when they left,” explains a post on the official Overwatch blog. “The assumption was that if a team was a person down, the odds of them winning would go down, too, and that the most accurate thing we could do was account for this when adjusting each player’s Skill Rating at the end of the match. Multiple players have since followed up suggesting the same issues remain unchanged, however Lylirra notes that “other factors”, beyond team numbers, impact Skill Rating—such as probability of success, individual performance, and win/loss streaks. She concludes her post with the suggestion that a misunderstanding of how the system works might be to blame, instead of perceived bugs, which is in itself an issue. The perception of balance in Competitive Play is clearly a difficult problem to solve. Even if Blizzard can confidently claimed to have fixed whatever is going on behind the scenes, player perception is ultimately more important. If the current system continues to cause confusion and discontent among players, a more substantial redesign might by on the cards—it's happened before, after all.